MagTrack II is a mini magnetic track system incorporating fixed or adjustable high CRi (CRI95>) LED magnetic mini spotlights and is ideal for use in retail display cabinets. 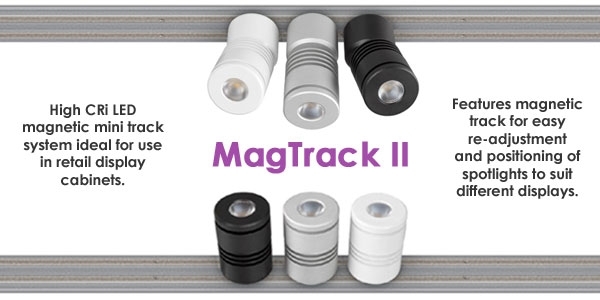 MagTrack II magnetic track enables easy re-adjustment and positioning of the spotlight heads to suit different displays. The track can be fixed horizontally inside display cases or vertically to allow the spotlights to illuminate shelving fixed at different heights.